Home Biology doctor dreams medical clothes medical students medicine memories nurse nursing organism professions scrub sets scrubs uniforms white lab coat In the Field of Medicine! When I was a child do you know what profession I'm dreaming of? Actually during our childhood school days, whenever our teacher asked me what profession I would like to pursue, I told them..."I want to be a doctor"! Yup a doctor! When I was a kid, I was inspired with the different doctors and nurses I've watched on TV. I like their intelligence, the way they can cure an ill person. I like how they explain the reasons behind diseases and the explanation about the anatomy of the human body. Another thing, I like the way they dress! It seems that they were very clean and neat. I love their white lab coat. 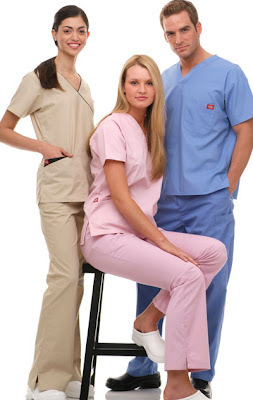 A female nurse looks very pretty while a male nurse looks very handsome while wearing this! I wonder someday, I will also look very neat and handsome wearing uniform and scrubs the nurses or doctors wear! I even love the medical tools they were using! I love to see them having scrub sets while holding a stethoscope or another medical tool in their hands. They look too professional! That's why in elementary and in high school my favorite subject is science! I was a topnotcher student specially in Biology! I love to study cells, tissues, organs, and systems! I like to research about the human anatomy! I love to dissect a fish, a frog, or an insect! And I memorized all the kingdoms of the different species!